This missing piece is one reason why there’s been little visible movement in the past year on the Ontario Retirement Pension Plan (ORPP). The plan's outline is this: The ORPP is coming in 2017, starting with larger employers. The plan is aimed at those Ontarians who lack a company pension plan; at its best, it will replace about 15 per cent of income to maximum earnings of $90,000, or $13,500 a year. It will be in addition to a Canada Pension Plan payment. The ORPP couldn’t easily move ahead without federal co-operation, and the Harper Conservatives offered none. Trudeau unlocked the jam Tuesday by making a promise to Wynne. 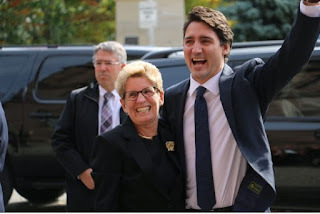 According to Wynne’s spokesperson Zita Astravas, Trudeau said that once he takes office, he will direct the Canada Revenue Agency and departments of finance and national revenue to work with Ontario officials on the registration and administration of the ORPP, The Star’s Robert Benzie reported. This is the same pension-administration help that Ottawa had extended to Quebec and Saskatchewan, but denied to Ontario. This week’s news is important because it means the ORPP can move ahead on its own, while Ontario participates in talks to expand the CPP. The Ontario plan hedges against the fact that expanded CPP talks will fail, but if they succeed, the province’s effort isn’t wasted because its plan would be folded into the improved CPP. Nothing has so far been said about CPP talks. But at a campaign stop in Toronto, Trudeau said he’d get going with the provinces within 90 days of becoming prime minister. That gives him until Jan. 17 to make good on his promise, a tight schedule given the long list of things on the new government’s plate. But given Trudeau’s nod to Wynne just a week after winning the election, the odds have improved that the CPP will be high on the new finance minister’s list. Polls show that Canadians are worried about retirement security and support a better national pension plan. They trust the CPP, seeing it as well run and reliable. They often quibble with the amount they are paid, but that’s a political decision, not something the CPP Investment Board controls. Research carried out by the Gandalf Group for the Healthcare of Ontario Pension Plan (HOOPP) in the middle of the election campaign confirms that Trudeau and Wynne are moving with public opinion. The research looks at attitudes toward workplace pensions, and in particular defined benefit pension plans. These plans are on the retreat in the private sector, but still widely available in the public sector. 74 per cent said higher pension contributions are a form of savings, and an investment in the future. Only 20 per cent saw the higher premiums as a tax, which is how the Conservatives painted the cost of a better CPP. In a world of economic uncertainty and powerful global forces, stronger public pensions protect workers against forces outside their control. After a decade of inaction and small thinking, it seems the will is there to do something. All that remains is finding the way. It will be mandatory for 3 million Ontarians without company pensions. Modelled after CPP. Has survivor benefit, but is not transportable. There is no opt out. At its best, the pension aims to replace 15 per cent of income. The fund would collect $3.5 billion a year, which would be invested at arm’s length. My regular readers know my thoughts on the Canadian economy. I've been short Canada and the loonie for almost two years and I've steered clear of energy and commodity shares despite the fact that some investors are now betting big on a global recovery. I think the crisis is just beginning and our country is going to experience a deep and protracted recession. No matter what policies the Liberals implement, it will be tough fighting the global deflationary headwinds which will continue wreaking havoc on our energy and commodity sectors and also hurt our fragile real estate market. When the Canadian housing bubble bursts, it will be the final death knell that plunges us into a deep recession. Having said this, I don't want to be all doom and gloom, after all, this blog is called Pension Pulse not Greater Fool or Zero Hedge. I'd like to take some time to discuss why I think the new Liberal government will be implementing some very important changes to our retirement system, ones that will hopefully benefit us all over the very long run regardless of whether the economy experiences a very rough patch ahead. Unlike the Conservatives led by Stephen Harper who were constantly pandering to Canada's financial services industry, ignoring the brutal truth on DC plans, both the Liberals and the NDP were clear that they want to enhance the CPP for all Canadians, a retirement policy which will curb pension poverty and bolster our economy providing it with solid long-term benefits. Of course, as always, the devil is in the details. Even though I agree with the thrust of this retirement policy, I don't agree with the Liberals and NDP that the retirement age needs to be scaled back to 65 from 67. Why? Because Canadians are living longer and this will introduce more longevity risk to Canada's pension plan. But longevity risk isn't my main concern with the Liberals' retirement plan. What concerns me more is this notion of voluntary CPP enhancement. I've gotten into some heavy exchanges on this topic with Jean-Pierre Laporte, a lawyer who founded Integris, a firm that helps Canadians invest for their future using a smarter approach. Jean-Pierre is a smart guy and one of the main architects of the Liberals' retirement policy, but we fundamentally disagree on one point. As far as I'm concerned, in order for a retirement policy to be effective, it has to be mandatory. For me, any retirement policy which is voluntary is doomed to fail. Jean-Pierre feels otherwise and has even written on what forms of voluntary CPP enhancement he's in favor of. There are other problems with the Liberals' retirement policy. I disagree with their stance on limiting the amount in tax-free savings accounts (TFSAs) because while most Canadians aren't saving enough, TFSAs help a lot of professionals and others with no pensions who do manage to save for retirement (of course, TFSAs are no substitute to enhancing the CPP!). "Unfortunately, there is a major flaw in the Liberal Party of Canada's resolution regarding an expansion of the Canada Pension Plan, which is that their proposal would exclude from coverage the first $30,000 of employment earnings. Indeed, although the LPC's proposal would well address the second more important goal of a pension plan, which is to optimize the maintenance into retirement of the pre-retirement standard of living, it would completely fail to address the first most important goal of a pension plan, which is to alleviate poverty among Canadian seniors." I thank Bernard for sharing his thoughts with my readers and take his criticism very seriously. I stand by my comments and even though I'm happy to see it's full steam ahead on the ORPP, I would prefer to see full steam ahead on enhancing the CPP (and QPP here in Quebec). Only that will propel Canada to the top spot in the global ranking of pension systems. It's important to educate Canadians on the the huge advantages of well-governed defined-benefit (DB) plans. These include pooling investment risk, longevity risk, and significantly lowering costs by bringing public and private investments and absolute return strategies internally to be managed by well compensated pension fund managers who are also able to invest with the very best external managers as they see fit, making sure alignment of interests are there. DB plans also offer huge benefits to the overall economy, ones that will bolster the economy in tough times and reduce long-term debt. All this to say that I don't really care if the Liberals won the federal election and Kathleen Wynne is happy and embracing Justin Trudeau. I take all these political grandstanding photo ops with a grain of salt. It's time to get down to business and let me assure the Liberals in Ottawa and Queen's Park in Toronto there's a hell of a lot work ahead and if they screw up this historic opportunity to significantly bolster our national retirement system, future historians will not be kind to them. But when discussing enhancing the CPP, there are a lot of issues that need to be properly thought of including whether the federal government wants to give the new pension contributions to CPPIB or direct them to a new entity. There's also the issue of pension governance and I think it's high time we stop patting each other on the back here in Canada and get to work on drastically improving pension governance at Canada's top ten pensions. In particular, it's time to remove the Auditor General of Canada from auditing our large public pensions (it's woefully under-staffed and lacks the expertise) and either have OSFI, which already audits private federally regulated pension plans, or better yet the Bank of Canada audit our large pubic pensions and keep a much closer eye on all their investment and operational activities. I've long argued that we need to perform comprehensive operational, performance and risk management audits at all our large public pensions. These should be performed by independent and qualified third parties to make sure that the governance at these pensions is indeed "world class" and the findings of these audits which can be done once every two or three years must be made public. Some of Canada's public pension plutocrats will welcome my suggestion, others won't. I couldn't care less as I'm not writing these lengthy blog comments to pander to them or anyone else. I speak my mind and I've seen enough shenanigans in the pension fund industry to know that when it comes to pension governance, we can always improve things, even in Canada where we pride ourselves on being leaders on governance. For me, it's all about transparency and accountability. If you have anything to add to this debate, feel free to email me at LKolivakis@gmail.com. I don't pretend to have the monopoly of wisdom when it comes to pensions and investments but I think I'm doing my part in educating people on the real issues that matter most when it comes to their retirement security. Below, watch Bernie Sanders tell Alan Greenspan, in 2003, that Americans are not living the way that Mr. Greenspan imagines they are (I thank my brother for sending me this classic clip). Also, Sen. Bernie Sanders asked a panel of experts to contrast the United States health care system with single-payer one in Canada. Whether or not you love Bernie, you have to admire his chutzpah. He nailed the 'maestro' and he nailed the key points on why single-payer health care is a better system (even if it's far from perfect). I think Bernie would totally be in favor of enhancing the CPP in Canada and possibly enhancing Social Security in the United States (provided they get the governance right) where the solutions to America's retirement crisis being peddled are outrageous and shortsighted. Of course, when enhancing the CPP or Social Security, you've got to get the governance right and make sure transparency and accountability are the pillars of any changes to the retirement policy.